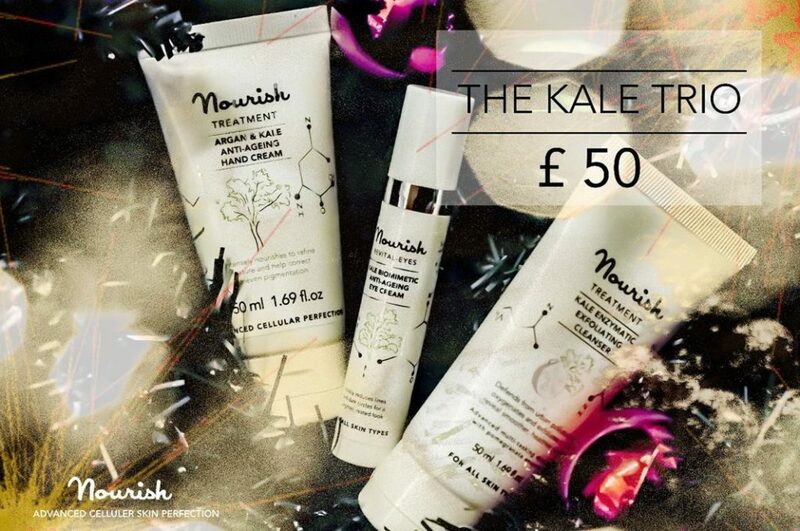 Throughout this year kale has been hailed as the magic ingredient in your diet but Nourish skincare was one of the first to introduce kale extract it into skincare. the new Kale Enzymatic Exfoliating Cleanser. In addition to the unique Kale extract with its array of skin enhancing vitamins ( C & K, as well as beta-carotene ), there is a full line-up of seasonal ingredients like precious frankincense, sumptuous Myrrh oil, ruby red Pomegranate – making this the perfect Christmas gift for those who appreciate natural beauty and skincare products. ‘Kale Trio’ is a special Christmas gift set which comes beautifully gift wrapped, ready for you to give – or to receive. All the Nourish products are natural, cruelty-free and endorsed by the vegan society so they make a wonderful ethical gift too. Order via nourishskinrange.com (free delivery in the UK).